20 YEARS OLD IN 2018! On passing such a milestone we thought it would be interesting to highlight a few production milestones. Over 2500 EZ Rider Coilover Conversion Kits. We would like to Thank all our Customers, past, present & future for your Support & Friendship! Videos from the Complete Kit Car track day we supported. Check out the view from inside and outside of our display bus! This is our new display bus. We will be closed for the Christmas Holiday from the 23rd Dec. and will not be available until the 3th Jan. 2017. Have a good Holiday and we will see you in the New Year! The Web Shop will still accept any orders you wish to place, but nothing will be actioned until we return. We are away at Busfest from tomorrow until Monday. We'll see you there or catch up with you next week when we return. If you are going have a great weekend! We are away at EBI Belgium and Camper Jam for the next 2 weekends. They are both long weekends so the phone and emails will be done as we can. We will get back to you as quickly as possible but please bear with us! Thanks and see you at one of the shows! Do you want to buy a Battleship! Bismarck, our T25 Crew Cab Pickup Truck is up for sale. This is a rare and cool truck that is much loved everywhere she goes. She has a 1.9 water cooled petrol engine with 5 speed box and most importantly is RHD. However, with age and use she has started to loose control of some of her faculties! Some bits have stopped working and some bits are temperamental, her pressure is up and down and she has the odd hot flush or leakage…no Tena Lady to save this old girl’s blushes! She is used everyday doing proper work, carrying steel and parts. We do around 250 miles every week and she starts fine, hot or cold. We drive gently and take our time and that seems to suit her too. So if you can see yourself at the helm of this beauty you will need to cross our palm with £3500.00 before you can sail off on your own mission. 22/07/14 Dub Odyssey and Le Bug Show attendance. Dub Odyssey is this weekend, our local show hosted by the Sheffield VWOC and the following weekend we will be at Le Bug Show at Spa Fracorchamps in Belgium. We will have our full trade stand at both so come a say hello if you are at either. Sam's 67 1500 returns to the road. Its been in our garage for 6 years, so its time we had it on the road. It seems a great idea to give your lad a car for his 14th birthday and tell him it will be ready for when he can drive! It's a bit late...but worth the wait. Follow the rebuild on the blog. Tea Break's are back on again this year! Back by popular request, last Saturday of each month, See you there! Red 9 Bus gets a clean! 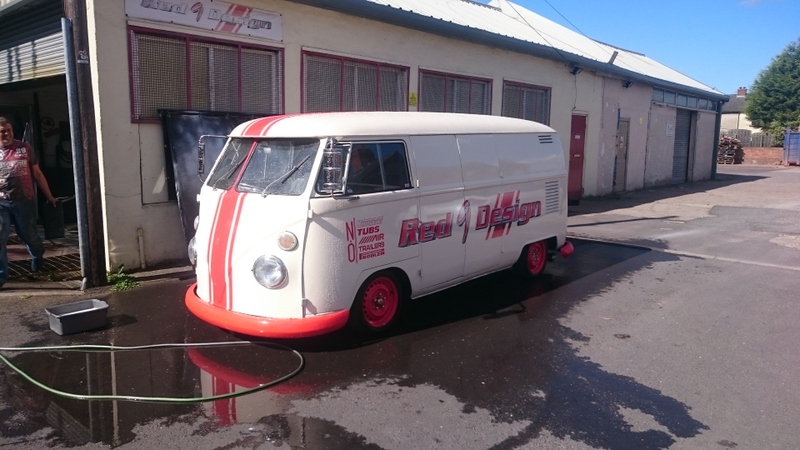 The Red 9 Carrera Bus has covered around 40000 miles and was beginning to look a little jaded, so it's currentlyy down at the Manflowers Workshop for a refresh! The Colour scheme will be the same, but we are having a few internal upgardes to make our camping even more comfortable. Tea Break's are back to normal for the rest of the year! Last Saturday of each month, See you there. No Tea Break this weekend 27th July. We Are attending our local Dub Odyssey at Hooton Roberts near Rotherham. So hopefully we will see you there. Tea Break will resume in August as normal. Closing for International Show duties! We have finally given in to pressure from our European cousins, to come and show them our goods! So we are away attending Shows on the European continent and the Works will be closed from the 7th of June until the 2nd of July. We’re not sure what mobile/email coverage we will have, so if you need anything it would be best to email the normal address on the ‘Contact’ page and we will get back to you on our return. May ‘Tea Break’ will be another ‘Birthday Bash’! As last year we will be celebrating Simon’s birthday at the 25th May Tea Break. Once again we will have an all day BBQ and cake available to all visitors! Do you need an excuse for a run out in your Bug or Bus? We thought we would have a monthly open day, but don’t want anything too formal. So on the last Saturday of each month we will be at the workshop for an All Day Tea Break. Have a ride out chew the fat and make new friends…First one this year will be 26th January 2013, see you there! Just prior to the 2012 Christmas Break we took the order for the 280th Bus Wishbone Front Kit! We think that’s amazing and would like to thank everyone who made it possible…That means YOU! Our Twin Wishbone IRS Setup is in full production and prooving very popular. Click here to get more details and place your order. The Red 9 Carrera Bus has had an engine upgrade. We have now completed our Subaru engine install and fitted one of our 4 pot front brake kits. Check details on the Blog. Please note that shipping charges are for UK customers ONLY. If you require international shipping please contact Red9Design. Accurate international shipping charges will be emailed and invoices will be processed via Paypal to provide the same level of security as UK sales.